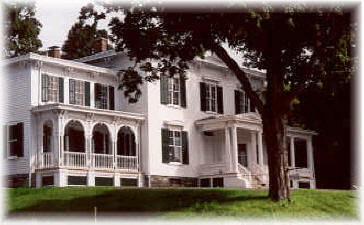 Enjoy a Gracious Bed and Breakfast Experience in an 1840s Italianate Inn, once a Mohawk Valley "Farm Baron's" home. We have five comfortable bedrooms, each with private bathrooms, robes, A/C & ceiling fans, cable TV with HBO, CD radio alarms and internet access. Our bedrooms are furnished with sturdy period antique furniture, comfortable seating and writing desks for your convenience. All of our mattresses were specially made for the Inn by Therapedic of Syracuse, NY to ensure your comfort and a restful night's sleep. Snuggle up to one of our Italian marble fireplaces with your favorite book or magazine. In season, relax on one of our porches. Sit in one of our many Adirondack chairs which dot the grounds and at the same time enjoy our panoramic views, reminiscent of the Tuscan Hills of Italy. We are also about 500 yards from the Mohawk River and historic Erie Canal. Start each day in our French Door dining room with a hearty Portobello Inn breakfast. In Summer our doors open for "al fresco" dining on the Victorian Veranda. In late Fall and Winter, enjoy breakfast by the warmth of a cozy fire in the dining room fireplace. Enjoy fresh ground and brewed coffee, specialty teas, local honey and jellies, seasonal fruits and fresh baked goodies. During the week, we provide an expanded Continental menu and on weekends, full "Country" breakfasts are offered. In Spring, Summer and Fall, as part of your stay at Portobello Inn, enjoy the Mohawk Valley Country Club, which is only 500 yards east of the Inn. Play a round of golf on the Clubs picturesque course, enjoy Tennis or swim in the clubs pool. Portobello Inn is easily accessible from the New York State Thruway; Exit 29A (Little Falls) or Exit 30 (Herkimer). We are convenient to many Central New York area attractions and historic sites and are also close to the Adirondack Mountains to our north and Cooperstown, only 25 country miles to our south. All private bathrooms, Cable TV with HBO, A/C & Ceiling fans, Robes, Wireless Internet, CD radio alarms, Mohawk Valley Country Club use, Video library, Reading library & Antique/Gift shop (opening soon). Five - All with private bathrooms. One room with King bed, Three rooms with Queen beds and one room with Twin beds. $110. to $150., Single/Double occupancy plus appropriate taxes. Portobello Inn can accommodate intimate weddings and receptions, small business meetings, teas, private parties and small catered events. Contact us for suggestions and details. "Corporate Rates" are available and "Extended Stays" can be accommodated. We have Wireless Internet. Please inquire for these special rates. Herkimer County Chamber of Commerce & The Oneida County Business & Convention Bureau. One nights deposit will confirm your reservation; balance upon arrival. Please remit deposits within 5 days of making your reservation. Rates are based on single/double occupancy and subject to taxes. Two (2) night minimum stay for Summer, Fall & Holidays. Roll-a-way bed available for 3rd person at additional charge (limited). Cancellation honored 2 weeks prior to reservation dates with the following exceptions, "Special Event" and "Holiday" weekends. Special corporate rates available for the business traveler. Extended stays accommodated (please inquire). Children accustomed to travel welcome. Facilities available for meetings, gatherings, private functions. Facilities available for teas & receptions. Antique & Gift Shop on premises (coming soon). We accept All Major Credit Cards, Travelers Checks, Personal Checks & cash. Check-in between 3pm & 7pm daily. (Late check-in is available with prior notice). Left on Rte. 5 for 4.2 miles to Portobello Inn. (We are the 3rd house on the right, just past the "Mohawk Valley Country Club). Take Rte. 28 north to Rte 5 in Herkimer (25 country miles). Take right on Rte. 5 and continue about 3.8 miles to Portobello Inn. Exit New York State Thruway Exit 30 (Herkimer) to light. Right at light, left at next light to Rte. 5. Right on Rte. 5 and continue 3.8 miles to Portobello Inn.